Tom Hanks was involved with several films I worked on doing after the filming sales and tech support to Museums or collectors. I heard so many stories about how great a guy Tom Hanks is to have on location. Tom Hank has a smile and a warmth that is very much like his public persona. He spends time when he can saying hi and talking to the people on the set. Tom Hanks knows how to make everybody feel welcome. In order to keep that unified feeling in the production of films, he likes to include families on his sets. For example, tech people were included in scenes as extras and their families were given the option of joining in on the fun of being involved with a big budget production. I know that one of the guys I worked with Pete mentioned how his daughters were in the film series Band of Brothers as extras. They were villagers and it was a huge thrill for them. As previously mentioned in other blogs, Pete supplied many of the guns you see in Band of Brothers. Simon Atherton used some of Pete’s guns as the models for his stunt and prop guns .The big guns used in both Band of Brothers and Saving Private Ryan were owned by Pete. Simon also used some of Pete’s collection in Black Hawk Down. I use to have some really cool behind the scenes photos, but I have since lost them. If I can get them out from wherever in my house they are, I will be sure to post them up. Pete is a very warm hearted guy who people want to hang around with and enjoy his happy disposition as well as his amazing stories. Pete will tell you so much in one hour of time that you walk away with more knowledge than you could have dreamed of on so many topics and I spent many hours talking to him or working on his sales. 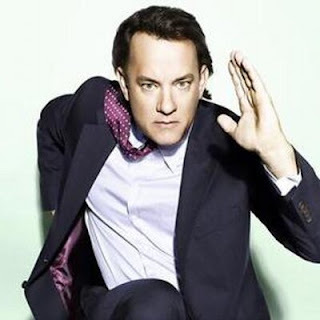 I like this photo of Tom Hanks because he seems to be always ready to share a laugh , provide a smile and have fun. Now back to Tom Hanks, Tom would share certain items that were created for the films with different people on the set. A great example of Tom Hanks’ kindness is in the story of a muddy gun. Tom had a small handgun in a scene on Saving Private Ryan .Since he had used it and it was in a unique state by being covered in mud, that gun was a rare find. I am pretty sure it was the Luger that was found in the mud. The fact that that gun made it to the hands of a certain big gun owner that I mentioned shows you the kind of warmth and awareness Tom has to those around him. The fact that the gun is still covered in mud in the exact state it was in when Tom Hanks finished using it shows you how much respect people who work with Tom have. They all share fond memories of filming with one of the highlights being working with Tom Hanks. He seems to be a People’s Legendary Celebrity. Tom Hanks reminds me of Matthew Morrison is how well he treats others and how much he cares for the people around him. Steven Spielberg’s great attention to detail and the actors having gone through basic training created a bond between cast members, extras and crew. Even though I have not met Tom myself. I have heard that Tom Hanks was very pleased with my work and he heard about the woman who sold and supported the artifacts that came from his work with Steven Spielberg. I felt those movies were important and each person is important so I made sure each customer left with a smile. If you want to learn more about me, Tom Cruise, Brad Pitt, David Spade, Peyton Manning ,Michael Buble or other celebrities check out my sites.